The Two Best Phones on the Market are the Apple iPhone 4 and the HTC Evo 4g. If you are not stuck in a contract with AT&T, Verizon or Sprint than you will have a tuff time deciding whether to go with the iPhone 4 or the Evo 4g. Both phones have decent battery life with the iPhone having the best battery but the Evo allows you to change the battery. The iPhone is on at&t's 3g network and the Evo is on sprints 4g network but you may not be an an area that is getting 4g coverage. The iPhone uses a flash drive instead of the standard micro HD card that most devices including the HTC Evo is using. As far as cameras the iPhone uses a 5 megapixel camera while the Evo is using an 8 megapixel camera. I have attached some YouTube video reviews of these products below and you can take a look at real world test with both the iPhone camera and the Evo camera. In spite of the Evo having a better camera the iPhone delivers much better video. It can be because the iPhone is recording at 30fps while the Evo is recording video at 25fps. Both the iPhone and the Evo record HD video at 720p. Both apple and HTC have front facing cameras. One draw back to the Apple iPhone is that there video chat only works on there network through WiFi, while the HTC Evo video chat works both on the phone and the Internet. The Apple iPhone allows you to edit movies right on the handset. The Apple iPhone still has issue with the call quality depending on how you hold the phone. The call quality on the Evo is excellent while the iPhone is good. Cnet.com picks the iPhone as the over all best phone. The iPhone has a smaller screen with a higher resolution while the HTC Evo has a bigger screen with less resolution. The Evo does support flash while the iPhone does not. 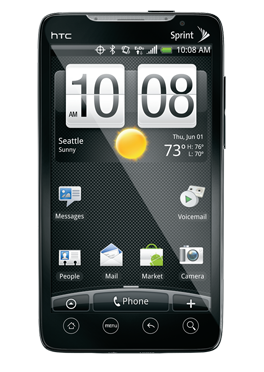 The HTC Evo has voice turn by turn navigation powered by Google maps. Both phones multitask. Evo has face chat without having to use WiFi. Evo 4 g has voice activate text messaging and voice navigation. You can replace the battery on the Evo but not the iPhone. Soldier knows best from YouTube did a side by side video test and it should that the iPhone actually takes better video than the Evo even though the camera on the HTC Evo is supposed to be better. What soldier knows best video comparison shows is it is not always about the stats, it’s about the execution of the final product. I have attached soldier video review so that you can see for yourself below. iPhone 4 or EVO 4g which one should you get? The bottom line is that you can’t go wrong with either the iPhone 4 or the HTC Evo 4g. If you have sprint than you will go with the HTC Evo 4g and if you have AT&T or Verizon you will go for the iPhone 4 because that will be the best deal for you. I think both phones are great it boils down to what specific features are most important to you. Take a look at the specs below and you decide between the iPhone 4 and the HTC EVO 4g which one is better for you.